Frank Cosentino has been very gracious about his induction into the Canadian Football Hall of Fame. The former CFL quarterback, university coach turned academic and author of 18 books — including three on Canadian football — couldn’t be happier to be going into the Hall as a builder. But he’s known for a long time that this was coming. Builder suits him best, but he’s qualified for the hall in every way imaginable. He was a star quarterback at Cathedral High School in Hamilton, where his team won a city championship. He moved 90 minutes away for university and won a pair of Yates Cups (1957 and 1959) with Western. The Tiger-Cats brought him home, making him the first overall pick of the 1960 CFL Draft. As a pro, Cosentino was one of the last Canadian quarterbacks to get heavy usage in the CFL. He played with the Ticats from 1960 to 1966, appearing in five Grey Cups and winning two. He was traded to Edmonton and spent the 1967 and 1968 seasons there before spending the 1969 season with Toronto. He made 513 of 1,083 passes for 8,890 yards and 48 touchdowns. It’s fitting that he’ll be enshrined in Hamilton, where everything began for him, on and off the field. “It’s my hometown, it’s where I grew up. My formative years, if you want to call them that, were spent in Hamilton,” Cosentino said. As his football career took him across the country, Cosentino never stopped thinking about what would be next for him. 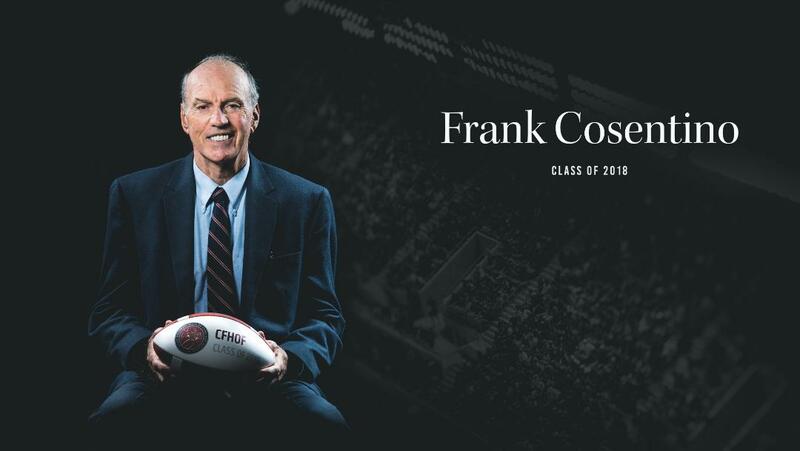 He picked up a business administration degree at Western and while he was with the Ticats he earned his bachelor of physical health and education at McMaster University in 1967. While in Edmonton, he found out about a masters in physical education at the University of Alberta. When he finished that in 1968, he went on to a doctorate program at the U of A. As his playing career wound down, he made the move back to Western to coach the Mustangs, while taking on an associate professor role. The Mustangs won Vanier Cups in 1971 and 1974, with Cosentino’s academic career and identity as a sports historian taking shape along the way. He feels a connection with all of the sports books he’s written. The topics range from Canada’s winter Olympic gold medalists to the 1972 summit series, to Almonte Ont.’s sports innovators James Naismith (the creator of basketball) and R. Tait MacKenzie, a pioneer in the development in kinesiology. His four books about Canadian football hold a special place in his heart, though. There’s a sense of glee in his voice as he recounts digging through football artifacts at a beach house in Hamilton before the Canadian Football Hall of Fame opened in 1972 as part of researching his first book, Canadian Football: The Grey Cup Years. He delighted in poring over the minutes of CFL meetings spanning decades, up to 1990 for another book. Cosentino was and still is at his happiest when his passions — football and sports history — can intersect. “I did feel a special attachment. Football had meant so much to me and still means so much to me,” he said. Also carrying him through a life of football and academics was his wife, Sheila. “She was kind of the glue that held everything together. Here I was in school for most of my football career and coaching career and she had four kids (Tony, Mary, Teresa and Peter) that she had to look after while I was off doing my thing,” he said. The day of our conversation, Aug 15, was his and Sheila’s 59th wedding anniversary. “That’s one thing that was very important and means a lot to me,” he said.